The Jaipur Development Authority’s dream project Ring Road appears to be just a dream now. JDA failed to take possession of land for the project from agitating farmers. On Wednesday, a JDA team went to Mahapura village to demarcate the land but returned empty handed. 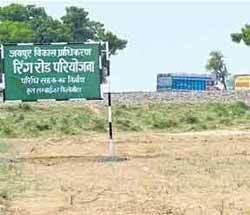 According to the sources at the Authority, a team of engineers went to the village on Wednesday to differentiate the land in Mahapura village for ring road project but the engineers were held hostage for one and half hours by the farmers of the village. Not only this, the farmers warned them not to come back until the state government takes a decision on the land issue. Another team was stopped to carry a survey in Gonair, villagers disallowed the team to even enter into the village. Ring Road is the solution to avoid accidents from heavy vehicles movement in the city; it is an only alternative of B2Bypass. Jaipur Development Authority is struggling hard to acquire land for its ambitious project.